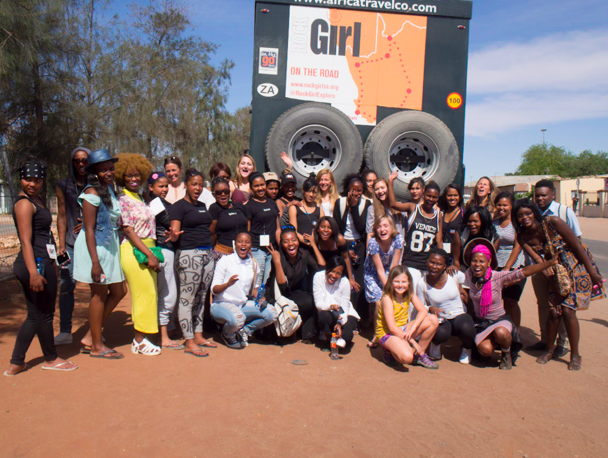 From October 2 to 11, 16 teenage girls from South Africa and the United States traveled from Cape Town to the Kalahari Desert on the second Rock Girl Road Trip. The girls interviewed girls and women along the way, documenting their lives through radio and photography, and kept blogs about their journey. They also visited community radio stations, sending out Public Service Announcements and messages of support to girls in places far off the beaten track. With little to no cell service or access to services, the girls in the Northern Cape have no way to share their stories or expose the challenges that they face. Rock Girl reached out to girls in Matjiesfontein, Upington, Calvinia, and Springbok, learning about the lack of high schools, youth programmes, job opportunities and about teenage pregnancy, drug and alcohol abuse, and sexual and physical violence. “Once we heard these girls’ stories,” said Audery February, one of the Rock Girls on the trip, “we realized that we had to share our own stories and Rock Girl helped us feel safe enough to do so.” On the last night of this epic trip, over half of the Rock Girls told of their own physical and sexual abuse by family members, of growing up in impoverished single and no parent homes, of the failure of their own families to provide the care needed for a girl to grow and thrive. United by their common tragedies, the girls agreed to work together to protect one another and to demand better treatment of girls across South Africa. Later this month, the girls will meet with the Minister of Justice, Michael Masutha, to brief him and demand solutions to some of the challenges they face. But the trip was also an opportunity to dream and explore. “I never knew that a girl could be a game ranger and head chef”, said Nazeerah Davids, “but after meeting Margeux and Mandy at Tswalu, I know exactly what I want to do with my life and I believe that I can achieve it.” The girls met with prosecutors, police, and magistrates in Upington at the Magistrates Court, with guides, chefs, managers, researchers, and nurses at Tswalu, and with women working in tourism and radio all along the way. These women shared remarkable stories of overcoming insurmountable hardships, inspiring the girls to never give up and work hard to achieve their goals. Watching these women deliver accused prisoners to their cells, track lions across the Kalahari, and change flat tires under the Cape mid day sun, the girls learned valuable life lessons. The girls also received training in photography, radio, and writing from the Rock Girl team, led by human rights lawyer India Baird and photographer Sue Johnson. Photographers Lindeka Qampi and Phiwe Badaza and radio trainer Tracey Mtsweni worked side by side each girl to share their skills. The girls’ photographs, stories, and radio recordings will be exhibited at an event on Thursday, 3 December in Cape Town and a documentary film is also being produced. The trip was made possible with the generous support from Africa Travel Co., Pick and Pay, Tswalu, Inhouse Brand Architects, Children’s Radio Foundation, Northern Cape Lodges, Cape Town Tourism, the Resistance Fund, and many generous individual donors, as well as the four American girls on the trip, who personally raised funds to support the South African girls’ costs. Plans are also underway for a US road trip that will include South African girls. Donations to help the Road Trip via GoFundMe. You can learn more about the trip at Rock Girl. Created for Pernod Ricard, NightVision’s new GH Mumm space at Seelan Restaurant & Bar is nothing to keep mum about!